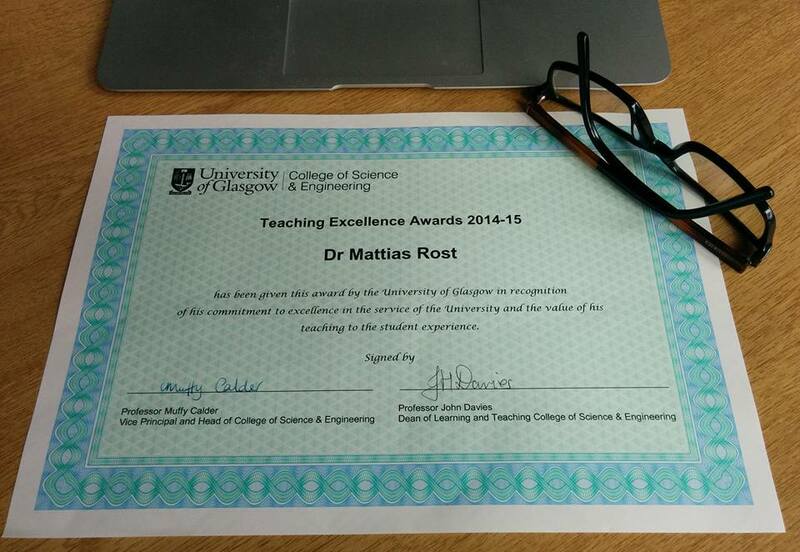 Last week I was awarded a Teaching Excellence Award from the college. The award was given for my teaching activities within the school , including: the development of a set of tutorials given to students and staff across levels, supervising undergraduate and postgraduate students, and contributions to undergraduate courses. I’m co-organizing an upcoming workshop for MobileHCI this year. It is on the topic of “Informing Future Design via Large-Scale Research Methods and Big Data”. It is loosely based on previous workshops I have co-organized on Research in the Large. This year it goes beyond evaluation and instrumentation of app stores (which in my view have been a big theme for the previous workshops) and looks at how we can find new ways of incorporating large deployments as means to inform design. This means not only to iteratively improve existing systems and design ideas, but to use it in the ideation process of new ideas. The deadline for the workshop submission is on May 10th and MobileHCI will be in Munich on August 27-30th. Check workshop web site for more info. On Monday I finally defended my PhD thesis – Mobility is the Message: Experiments with Mobile Media Sharing. The opponent was David Ayman Shamma from Yahoo! Research. He did an amazing job presenting his interpretation of my work, and we engaged in a lively discussion about the thesis. It was followed by questions from the committee, and the audience. Today I’m giving a Pecha Kucha style presentation of our CSCW paper ‘Representation and Communication: Challenges in interpreting large social media datasets’ (Rost, M., Barkhuus, L., Cramer, H. and Brown, B. ), at the University of Gothenburg during an event about social media research. The purpose of Pecha Kucha is to make the presentations more focused and to the point. The format is to show 20 slides, each slide for 20 seconds. It restricts you from going on and on. It will be the first time I will do a Pecha Kucha presentation and am looking forward to it. I hope it will be as fun for the audience as I will have while giving it! Find the abstract of the paper below. the end user uses to which social networks are put. On March 11, I will defend my PhD thesis ‘Mobility is the Message: Experiments with Mobile Media Sharing’! The official announcement is here, and you can already find the thesis here. The thesis is comprised of 6 papers and 100 pages of new material that brings the 6 papers together. Find the abstract for the thesis below. This thesis explores new mobile media sharing applications by building, deploying, and studying their use. While we share media in many different ways both on the web and on mobile phones, there are few ways of sharing media with people physically near us. Studied were three designed and built systems: Push!Music,Columbus, and Portrait Catalog, as well as a fourth commercially available system – Foursquare. This thesis offers four contributions: First, it explores the design space of co-present media sharing of four test systems. Second, through user studies of these systems it reports on how these come to be used. Third, it explores new ways of conducting trials as the technical mobile landscape has changed. Last, we look at how the technical solutions demonstrate different lines of thinking from how similar solutions might look today. Through a Human-Computer Interaction methodology of design, build, and study, we look at systems through the eyes of embodied interaction and examine how the systems come to be in use. Using Goffman’s understanding of social order, we see how these mobile media sharing systems allow people to actively present themselves through these media. In turn, using McLuhan’s way of understanding media, we reflect on how these new systems enable a new type of medium distinct from the web centric media, and how this relates directly to mobility. While media sharing is something that takes place everywhere in western society, it is still tied to the way media is shared through computers. Although often mobile, they do not consider the mobile settings. The systems in this thesis treat mobility as an opportunity for design. It is still left to see how this mobile media sharing will come to present itself in people’s everyday life, and when it does, how we will come to understand it and how it will transform society as a medium distinct from those before. This thesis gives a glimpse of what this future may look like.